Kale has turned into a food rockstar over the past few years – and for good reason, because it has a long list of health benefits. Packed with antioxidants, vitamin C, vitamin K, potassium, and even omega-3 fatty acids, kale deserves its designation as a superfood. But here’s the truth: kale is not known for being delicious. It tastes bitter, has tough stalks and chewy leaves, and as a result a lot people prefer it pulverized and hidden in a smoothie rather than on a plate. That is, until they try massaged kale salad. Yes, I know that sounds odd. But I promise we’re not talking about dimming the lights, breaking out the baby oil, and lighting a few candles to help your kale unwind after a long day. Instead, massaging your kale involves kneading and rubbing greens with oil for 2 to 5 minutes to make them even more delicious. Massaging kale using oil helps break down cellulose, softening the leaves and making kale easier to digest. You might also notice leaves shrinking and becoming more vibrant in the process. If you’ve never tried it, now’s your chance. 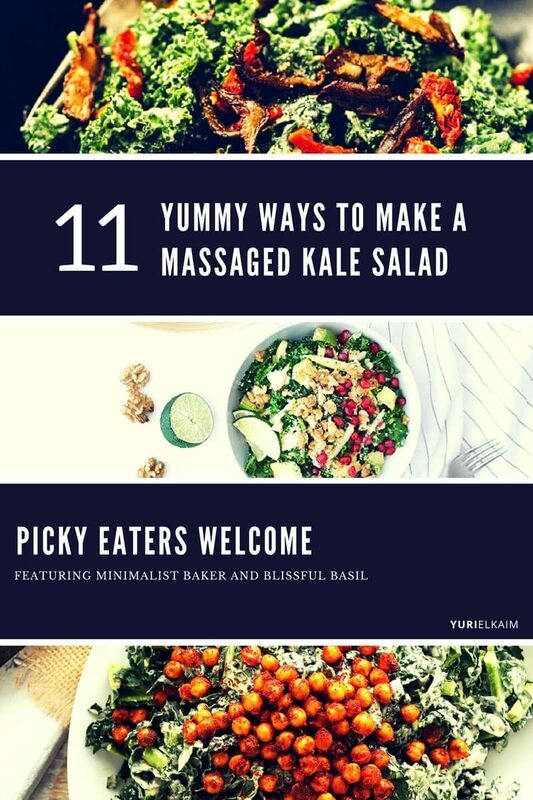 I’ve compiled some massaged kale salads that are perfect for getting you started. Bright and cheery, this light and refreshing salad is perfect to enjoy on a warm summer day. Not only that, it’s bursting with vitamins and minerals. 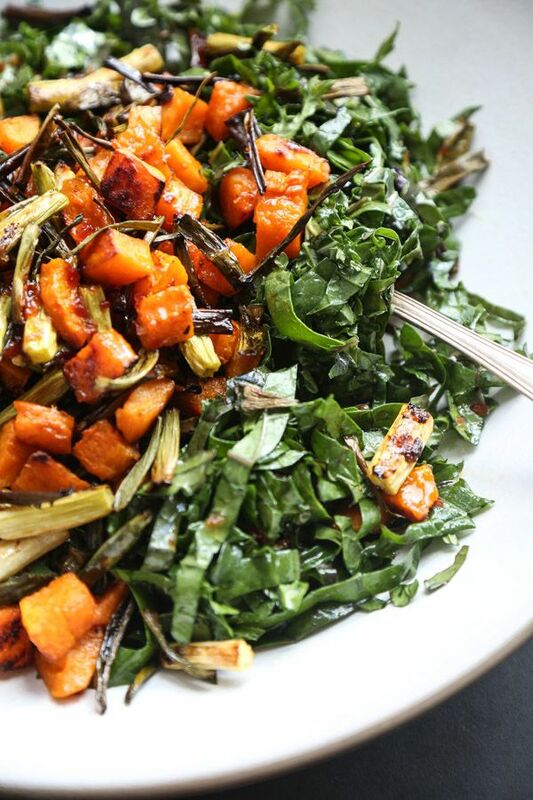 Between the sweet potatoes, persimmon, pumpkin seeds, and kale, this dish boasts an impressive nutrient profile. 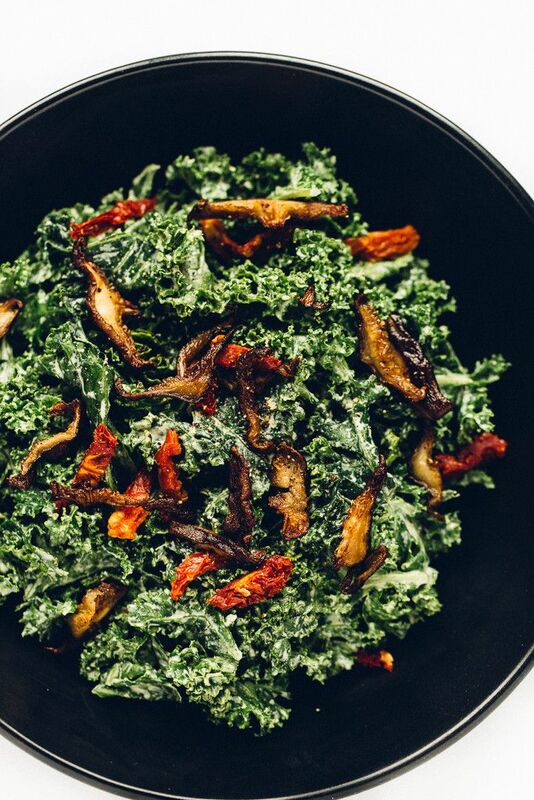 This tasty massaged kale salad recipe is a guaranteed game changer. The creamy texture of avocados is offset by the crunchy goodness of salty sunflower seeds. Plus, pickled red onions add a surprising twist to this scrumptious kale salad. Forget salad as a side dish – this tasty salad is so hearty and satisfying that it can be served as the main course for a flavorful plant-based dinner. Featuring white beans, which have a whopping 15 grams of protein per cup, this salad dressing will keep you feeling full and crush any cravings. Leave out the garlic croutons to make this dish vegan and gluten-free. Ready to take your tastebuds on a journey? Try this incredible vegan Caesar dressing on your next massaged kale salad! Creamy and full of garlicky flavor, this salad might taste rich and indulgent, but you can feel free to help yourself to seconds or thirds, no guilt needed. This healthy take on traditional Caesar salad is sure to become a staple in your family’s dinner rotation. Shiitake “bacon” plus sun-dried tomatoes give this salad an upgrade in flavor while a hemp seed Caesar dressing kicks up the flavor quotient even more. The best part about this salad – besides the fact that it tastes great – is that it’s customizable. The basic massaged kale salad requires just four simple ingredients, but you’re able to spruce it up with whatever you’re in the mood for. Grapes, avocado, and toasted pine nuts are suggested as a few tasty topping ideas, but you can add whatever you have on hand. With granny smith apples, avocados, pomegranate, and walnuts, this salad strikes the perfect balance of flavors. Plus, it features an amazing tahini dressing with pure maple syrup that takes this dish from good to incredible. 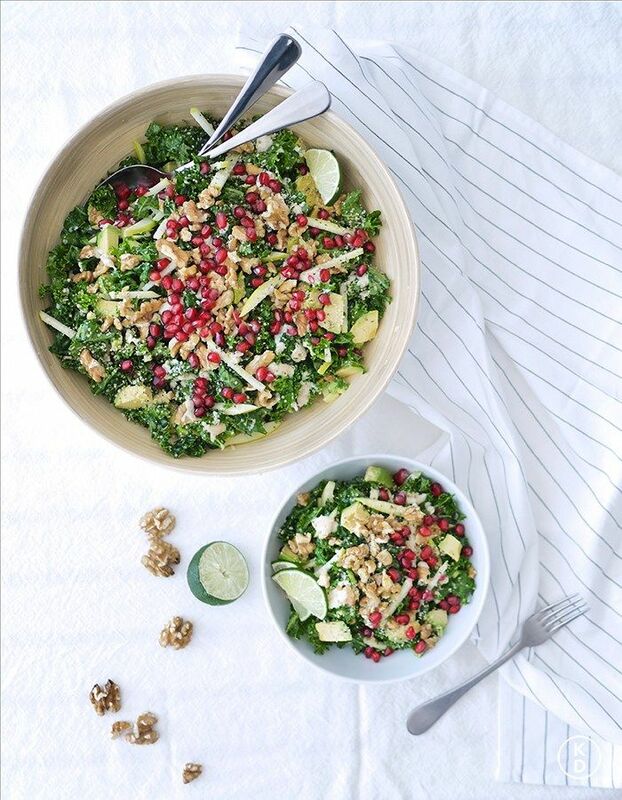 Believe it or not, this vibrant kale salad really does taste as good as it looks. 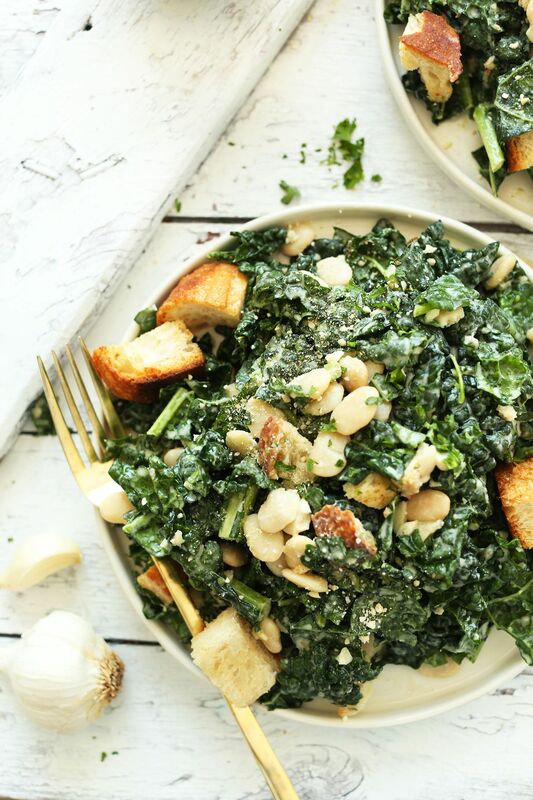 This simple kale salad is super easy to make, full of flavor, and comes together in a flash. 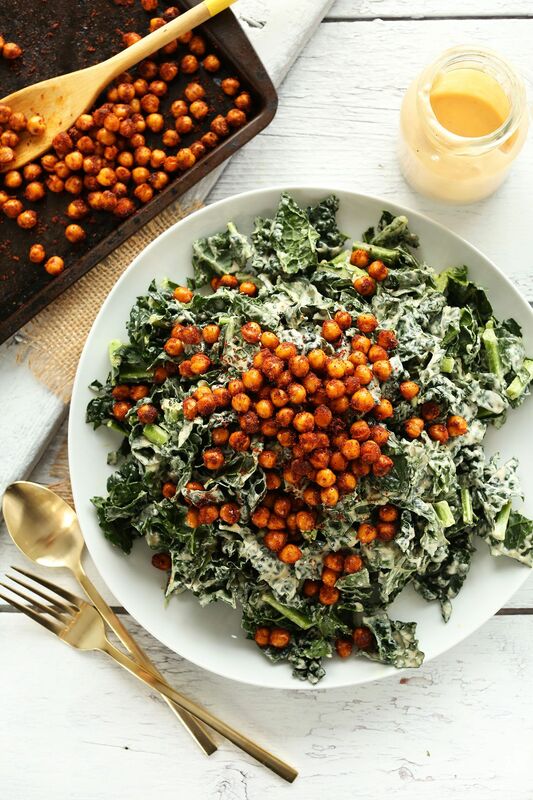 Tandoori roasted chickpeas are what really bring this salad to the next level. On top of some tender massaged kale and a garlic tahini dressing, you’ll love their exotic taste. Hearty, vegan, and oh-so-delicious, this warm salad will seal the deal on your love for kale with just one bite. The secret to the coconut flavor is to cook the quinoa in light coconut milk and top the dish with coconut flakes. Add kale, red onion, and a tropical cilantro-cashew pesto and get ready to enjoy. 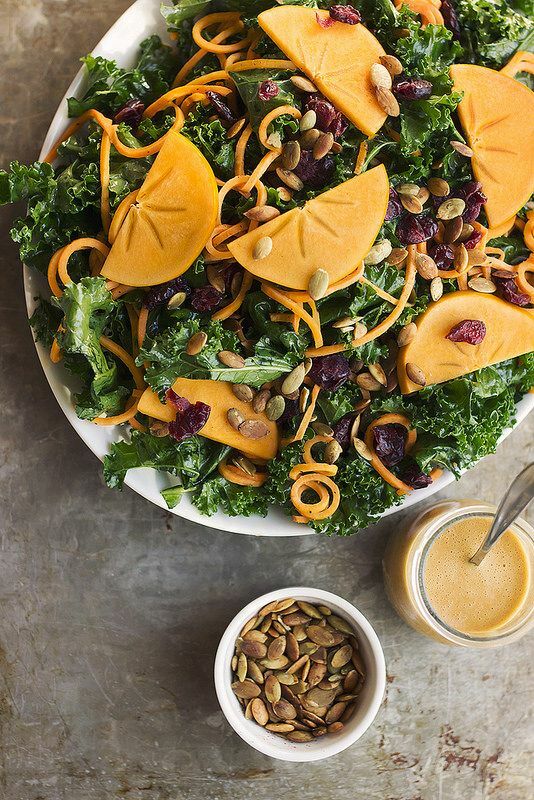 Sweet butternut squash plus the perfect tangy chili dressing make this kale salad a crowd pleaser. This salad is also easy to prepare: roast up a few vegetables, whisk together the spicy dressing, and combine to create a mouthwatering dish the entire family will love. If you haven’t tried massaged kale salad, you don’t know what you’re missing. With such a diverse range of flavors and nutrients, there’s no excuse not to give it a shot. Next time you whip up a hearty bowl of kale salad, spend a few extra minutes to give it a massage to let the flavors really shine. You’ll definitely be able to taste the difference. Looking for more healthy meal ideas that are free of dairy and gluten? Be sure to get your copy of the All Day Energy Diet Community Cookbook. This FREE cookbook contains 67 delicious recipes that are low in sugar and allergens, but high in taste. They’re also designed to be easy to prepare on even the busiest weeknights. Get your copy by clicking the banner below!